Two Canadian computer scientists, Greg Kondrak and his graduate student Bradley Hauer, published a study in the journal Transactions of the Association of Computational Linguistics about their efforts to decode the mysterious 600 year-old Voynich Manuscript. 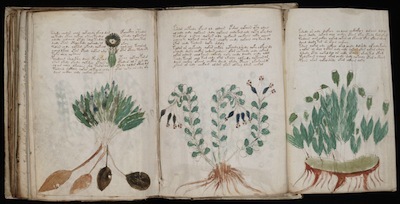 The scientists from the University of Alberta used an algorithm to try to decode parts of the Voynich Manuscript. They approached the text armed with a computer program of their own design, and the algorithm found that 80 percent of the encoded words appeared to be written in Hebrew. With the help of Google Translate, they determined the first sentence read: "She made recommendations to the priest, man of the house and me and people." The researchers say they've determined the language and coding scheme of the text. The next step is to find a scholar well-versed in Hebrew and alphagrams, and then apply this code-breaking technique to other ancient manuscripts.